Early season king fishing is both fun and challenging. It’s fun because there aren’t many people fishing yet and we get much of the river to ourselves. It’s challenging because the king run is just beginning and there aren’t many fish in the river yet. Total time is 6 hours dock to dock and fishing is over when the last person keeps their legal bag limit. Take advantage of special early season salmon fishing prices. These are our most popular guided Alaska salmon fishing charters. Total time is 6 hours dock to dock, which gives most of our guests plenty of time to catch their fish. Fishing is over when the last person keeps their legal bag limit and then it’s picture-takin’ time at the filet table. These are some of the best salmon fishing prices in Alaska. 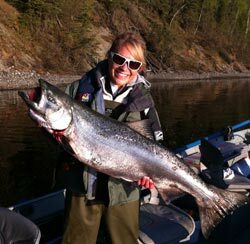 These Alaska salmon fishing charters are very popular for those who have limited time to spend in Alaska and want to up their chances to catch more fish. These trips are 8 hours dock to dock and are designed for the avid fisherman who can’t manage to scratch the fishing itch on one of our standard 6-hour charters. When 4 or more people book the boat for a full day charter, we have extra time to enjoy the day and fish more water This is a great choice for those of you who just can’t get enough fishing and want to experience more from their Alaska salmon fishing charters. Additional people can be added at regular salmon fishing prices. Normally we book 4-5 people on a charter, however if you “Buy the Boat” and book the minimum 4 seats, then your party will have exclusive use of the boat and we will not add any additional people to your group. You can still add up to 2 more people at the regular salmon fishing prices. Even if you don’t have 4 people in your party you can still book 4 seats and have exclusive use of the boat. When booking choose the “Buy The Boat” exclusive charter option. Fly Fishing provides a more personalized trip. We typically only take 2 anglers, allowing our guides to teach and cater to your individual needs and preferences. Each half day trip is 6 hours put-in to take-out. With out custom 18 ft power drift boat, it will take 15-30 min to get to our fishing destination. Using a jet powered boat allows us to fish prime water where ever we go. Fly Fishing from a “drift boat style” raft is a relaxing and very scenic trip. We are able to stealthily travel down the river covering lots of water. Chances of hooking into a big trout go up as you cover more water. There are also good opportunities to see wildlife because the raft is a very quiet means of transportation. You will park your vehicle at the take-out and our guide will taxi you up to the put it. That way, you can go straight from the river to your car and be on your way to grab a bite before bed. Our 8 hour full day option provides the best opportunity to hunt down the trophy fish of a lifetime. Being able to fish every hole and pocket in a given stretch of water means your chances of landing “the one” go up. Having the ability to fish only prime water with our custom jet boat, we can ensure you are put into a prime position for catching an amazing specimen. Using our “drift boat style” raft, we are able to fish the best water, while having a very relaxing day. The quiet of the river truly magnifies the experience. On these trips, you have control of the reigns. The time belongs to you and you can use it as you please. We can spend a portion of time targeting salmon and then switch for trout. We can park on a gravel bar and swing deep and long for King Salmon, or travel to a remote spot that is chalk full of hungry fish. With our jet boat we can get to to places inaccessible by other means. If you desire to plan a customized Alaska salmon fishing charter package for your family, friends or large group, we will be happy to work with you to make it happen. On custom charters we work with you on adjusted salmon fishing prices. We can do customized half day, whole day, or multiple day Alaska salmon fishing charters, sightseeing trips, and adventures. On custom trips we have more time to teach you some of the best salmon fishing techniques. Call us to discuss your ideas and we will help you decide Where to Go Salmon Fishing on your next Alaska Fishing adventure . First come first served: All of our fully outfitted and guided Alaska salmon charters are booked on a first come first served basis. Space does fill up quickly so early reservations are suggested. To reserve space on one of our charters please read the conditions listed below, check our salmon fishing prices, and choose one of the following methods. Use our secure online registration process by clicking on one of the Book Online buttons. Call to make your reservation: 1-907-357-0131. Payment: We accept all major credit cards for online or phone transactions. You may also choose to pay by check and mail it to us. Reservations will not be final until payment is received in full. Online Reservations: Payment for online reservations occurs at the time of booking and includes a booking surcharge of 6% charged by our booking system provider. You may see Stripe on the billing. Conditions: Alaska Guides Inc. dba: FishAlaska Guide Service will not be responsible or liable for loss, damage, or injury to guests or personal property or for cancellation expenses resulting from weather, transportation, or acts of God. By completing and submitting the online reservation it implies that you have read and agreed to these conditions. Cancellations: We have a 14 day cancellation policy. Any trip cancelled inside of 14 days will not be refunded but we will attempt to reschedule your trip if possible. If we must cancel your trip due to circumstances beyond our control, you may reschedule the trip or we will issue you a refund. Additional information: For a quality experience we book up to 4-5 guests, but can carry up to 6 guests in our large 24 foot boat. All fishing ends when the last party member keeps a daily bag limit. Alaska Department of Fish & Game regulations will be followed.